Business Central officially opened its doors on Jan 8th in the newly built Adirondack Hall’s North wing pictured here. Kate Baker has been at her new job for two months. 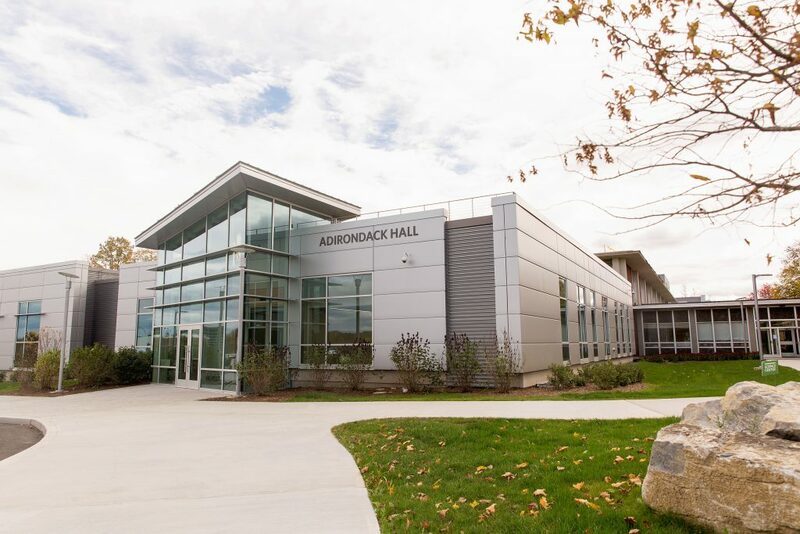 As director of SUNY Adirondack’s new Business Central—a program devoted to fostering entrepreneurship and developing relationships between students, community members and regional businesses in Warren, Washington and Saratoga counties—her job is to facilitate the growth of the region through entrepreneurship, collaboration and innovation. Baker is no stranger to entrepreneurial endeavors and helping people start new businesses. 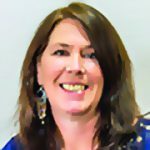 She came to SUNY Adirondack with 11 years of experience under her belt from her tenure with the SUNY Albany’s Small Business Development Center (SBDC), where she helped more than 1100 new businesses in the Capital Region. Business Central officially opened its doors on Jan. 8 in the newly built Adirondack Hall’s North wing. Baker described it as a “one-stop shop,” open to both students and members of the surrounding region to receive support and assistance as they contemplate starting up a new business or are looking to expand an existing business. It is also a place for students to come who are looking for internships or full-time employment opportunities. Business Central is part of the 13,250-square-foot building addition and it offers a 4,100-square-foot conference space – the Northwest Bay Conference Center. Baker said it can accommodate up to 300 people. 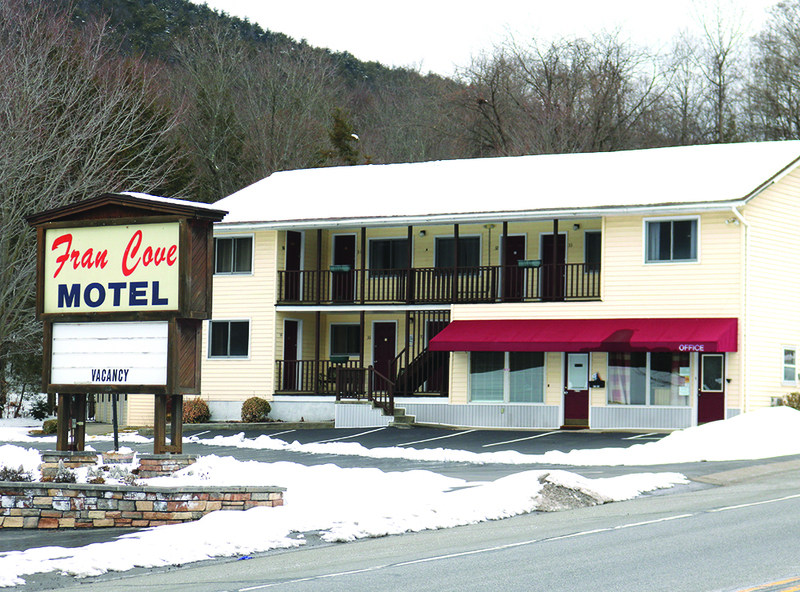 The Fran Cove Motel on Route 9 in Lake George was recently sold to Mudassar (Manny) and Ahmad Ghuman, for $1.1 million. The Fran Cove Motel on Route 9 in Lake George, a recently modernized facility about half a mile from the lake, was recently purchased by Mudassar (Manny) and Ahmad Ghuman, for $1.1 million. The acquisition is the ninth motel in the area owned by members of their family, but the first venture for the Ghuman brothers. It is the second recent motel sale on the lake. Mitchell B. Muroff, Esq., principal with MD/Muroff Daigle Hospitality Group said the EconoLodge-Lake George sold in February to Amber Hospitality Group. Regarding the Fran Cove Motel, the Ghumans said they plan no major changes to the facility and expect to reopen it on Memorial Day weekend. One of the new owners, Manny Ghuman, seemed unfazed by the fact that this will be a new venture for him and his brother. “The family will help,” he said. They can also expect advice from the sellers, Linda and Tim Kissane, said Gloria Caldaroni Ford, the real estate agent who brokered the deal. She is also a cousin of the previous owners,. Peter Aust was hired as the interim executive director of the Queensbury Senior Center. The board of trustees of the Queensbury Senior Center (QSC) has hired former Adirondack Regional Chamber of Commerce president and CEO Peter Aust as its interim executive director. “With recent changes at QSC and our board’s commitment to ensuring the growing organization continues to move positively forward meeting the needs of our membership, we were fortunate to have Peter agree to join us on an interim basis. We’re confident that his knowledge and expertise in leading organizations to new heights will serve our QSC well over the next few months,” said Rev. Monty Robinson, president of the board of trustees. Aust has extensive experience and certifications in nonprofit leadership. He was ARCC president and CEO for over 16 years. 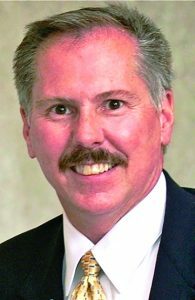 He has also served on numerous local, state and national volunteer boards, including most recently the Tri-County United Way, the Warren/Washington/Saratoga Workforce Investment Board and the U.S. Chamber of Commerce Board of Regents. 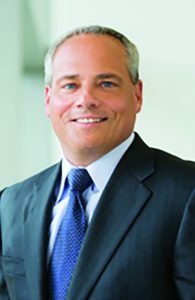 Thomas Caufield has been named the new CEO of GlobalFoundries. After more than four years as chief executive officer of GlobalFoundries, Sanjay Jha will hand over the company’s top position to Dr. Thomas Caulfield, who has been the senior vice president and general manager of the Malta Fab 8 plant since 2014. Caulfield, who lives in Saratoga Springs, joined the company in 2014 following a career spanning engineering, management, operational leadership and global executive experience with leading technology companies including 17 years at IBM in a variety of senior leadership roles. Ron Sampson will take over as senior vice president and general manager of Fab 8. Sampson leads the operations and technology development at the Malta factory. According to the company, the Malta plant is the most advanced foundry facility and one of the largest public-private partnerships in the United States. 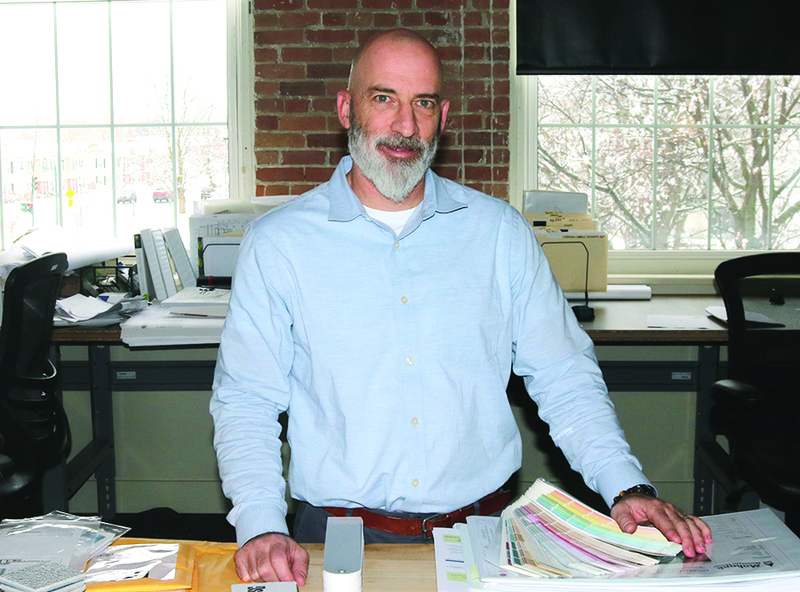 Andrew Allison, founder of AJA Architecture in Glens Falls, moved his firm into larger quarters, a building at 9 Broad St. that has 1,400 square feet of space for his growing business. AJA Architecture in Glens Falls has moved a few doors down from their previous location. The architecture firm, headed by Andrew Allison, is now located at 9 Broad St.
Allison said the original location was a startup building. In the past three years, the firm has grown to a staff of seven people. The new location has 1,400 square feet of space which will meet staff needs. The warehouse-type building offers plenty of natural light. “The thing about Glens Falls is there are so many great places where businesses like ours can grow,” he said. Allison graduated from Pennsylvania State University with dual degrees in architecture and structural engineering. Allison worked for architectural firms both local and throughout the United States for over 13 years before starting AJA Architecture. The little secret at the Queensbury Hotel may not stay so little or so secret. Danika Hajeck, a medical aesthetician and hair, eyelash and makeup artist, has set up shop at the hotel, offering services to a variety of clients, including bridal parties. Since the grand opening of Our Little Secret Beauty Bar in February, she has been busy providing her services at the hotel, and building a business that she hopes will continue to grow. “I am delighted to be located at the Queensbury Hotel and have [an] opportunity to provide a unique experience for wedding parties,” said Hajeck. Craig Merrell, owner owner of the Downtown City Tavern, plans to open the Downtown Social Eatery and Lounge at that location. He said it will offer house-roasted coffee, baked goods, deli sandwiches, a carving station, wine bar and more, including table service for people looking for a traditional dining experience. The 7,500-square-foot space will bring a unique experience to the downtown area, according to George Normandin of Normandin Marketing, who is handling publicity for Merrell. 190 Grille and Cinema, located at 190 Glen St., closed in early December, after two and a half years in operation. Merrell signed a lease for the property shortly afterward, according to Normandin. 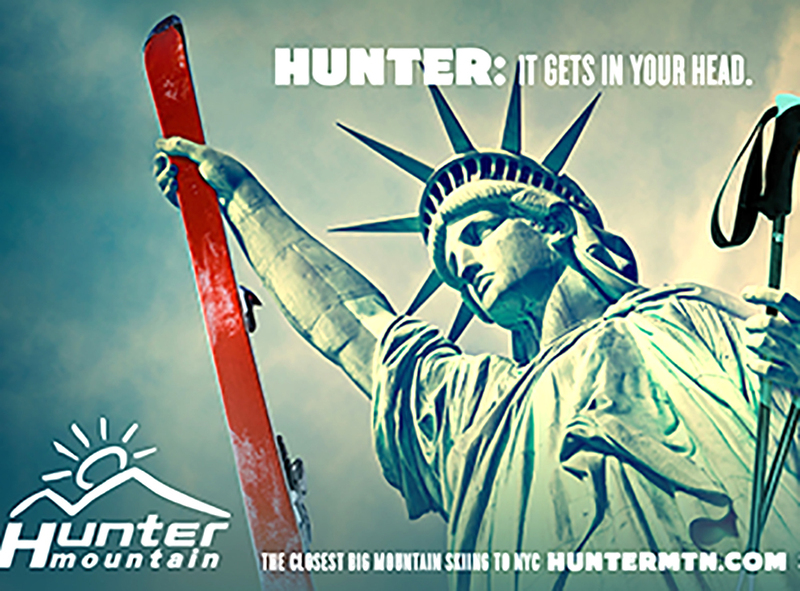 Trampoline Design in Glens Falls won a gold award for an advertising campaign for Hunter Mountain focused on the New York City metro campaign, of which this sign is a part. Glens Falls-based Design and communications agency Trampoline Design won a judge’s citation, a gold award, five silver awards and the Betsy Best in Show award at the 2018 American Advertising Awards-Capital Region event, held March 3 at Proctors Theatre in Schenectady. Trampoline is a state-registered woman-owned agency established in 2003. The studio specializes in destination marketing, higher education, municipal and lifestyle brands, and has a full-time staff of 17. “We have participated in this event almost every year since we started Trampoline. It’s an opportunity for our creative team to be recognized by their peers as well as a way to demonstrate to our clients that we love the work. I’d also say that it’s a great way to stay hungry and on the quest for the strongest and most effective design and messaging, for our clients and for ourselves,” Amanda Magee, partner, Trampoline Design. The judge’s citation was given for Trampoline’s design and custom illustration for the Wildcat Mountain Resort 60th anniversary poster. This project was completed as part of Trampoline’s relationship as Peak Resort’s Agency of Record. The Massry Family Children’s Emergency Center will be exclusively for children and teens through 18 years old, and will be open 24 hours a day, seven days week, year-round. The four-story, 70,000-square-foot facility, which will be located adjacent to the current Emergency Department, is designed specifically for the needs of children and their families, and offers access to the full range of pediatric specialists. It will be staffed by physicians, nurses and mid-level providers specially trained in pediatric emergency medicine.